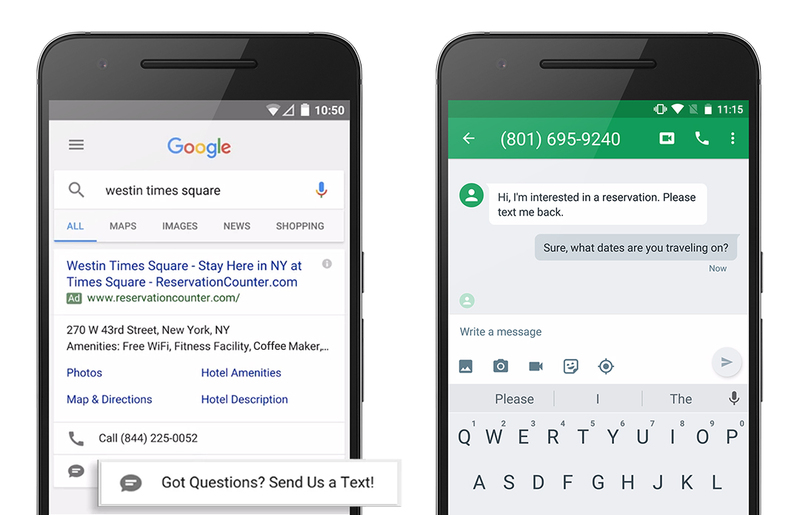 In the coming weeks, we’re introducing click-to-message ads to bring the efficiency and effectiveness of messaging to search ads. By setting up a message extension, you’ll give users an easy way to text you to start a conversation and continue it whenever is most convenient for them. "Click-to-message is a useful tool that allows consumers to engage with our business in a way that’s comfortable and efficient for them. They could be on their commute or in a rush, so they can text us quickly through click-to-message. It’s also a good medium to get questions answered that aren’t addressed on our website, or to reach us during hours when our office is closed. Our main performance objective is to help customers as much as possible - when we take care of their questions and needs in a helpful, relevant way, that leads to better business results." "The results from click-to-message have been phenomenal and we've seen a 80% higher conversion rate when compared to other similar channels. We can now tap into an important consumer base that prefers to use SMS to learn more about our insurance products. Besides giving users a new way to get in touch with us, we feel this is by far the fastest and most cost-effective way to connect with them." “We started testing click-to-message as soon as we heard about it. Text messaging is a popular medium of communication among young professionals and the opportunity to engage them through SMS is very exciting. We sell industrial equipment and supplies, which can be very technical. Sometimes customers don’t have time to talk over a web chat or phone conversation, but still need more information. Messaging helps simplify these exchanges and the customer response has been very positive since they can post a question and follow up in their own time." Mobile users have more flexibility than ever to choose how they want to connect with businesses. Through messaging, you can initiate valuable conversations with them by tapping into one of their most preferred modes of communication. Learn more about click-to-message ads by visiting the Help Center. Also read our new best practices to learn how to use click-to-message ads to build a faster consumer experience on mobile and deliver useful information that gets customers closer to purchasing. Find new customers, right where they’re searching. Connect your products to the customers who matter most -- the ones searching for what you sell. Peter Baseio, founder and CEO of baby product company Organic Munchkin, connected his BigCommerce account to Google Shopping to reach new customers with rich, visual ads. “Google Shopping allows our products to be listed in a visual format, increasing brand awareness for our niche market, as well as revenue,” said Baseio. “It has tripled our revenue stream, bringing in customers we never knew we had access to." Sam Gong, co-founder of Man Crates, used the integration to help tens of thousands of new customers find their unique assortment of gifts. 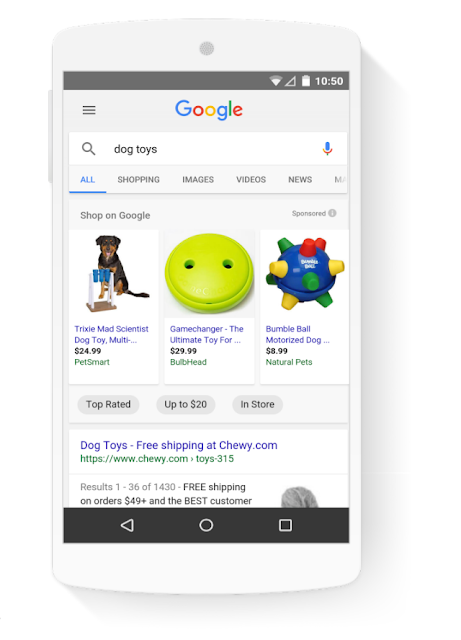 "Google Shopping is an incredibly cost-effective way for us to reach new customers on long-tail search terms and recapture visitors that have found Man Crates through one of our primary marketing campaigns,” said Gong. “It's well integrated with BigCommerce, incredibly easy to setup, and easy to measure and manage on an ongoing basis. It’s an absolute no-brainer for just about any ecommerce business." When it comes to attracting customers over the busy holiday season, showcasing your products online can help you get in front of more people, and many retailers already use ecommerce platforms to upload and promote their products online. Today, we’re excited to announce partnerships with three major ecommerce platforms -- BigCommerce, PrestaShop, and Magento -- to make it easier than ever before to get started on Google Shopping for the holidays, and beyond. If you’re using any one of these platforms (or if you’re thinking of using one of these platforms), our new partnerships let you easily submit your product information to Google Shopping and quickly reach millions of new customers searching for what you sell. experiences at scale. AdWords Editor is here to help -- and just in time for the holidays. The latest version (11.6) includes support for universal app campaigns, Gmail ad templates, and much more.